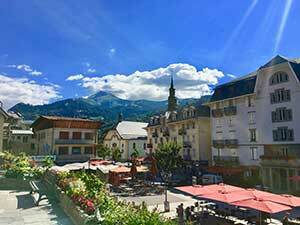 Less than one hour from Geneva is the charming little town of St Gervais-les-Bains. At 850 metres, and surrounded by 4,000 metre peaks including Mont Blanc (4810 metres), Dome de Gouter (4304 metres) and Aiguille de Bionnassay (4052 metres), St Gervais has a definite alpine feel. It is also an excellent base in its own right: home to 6,000 locals, St Gervais has a number of good restaurants (one with a Michelin star), relaxed cafes, trendy bars, quality food shops and other amenities to keep visitors happy. So this is a great place to relax, soak up the mountain air and enjoy the best French produce. St Gervais also boasts three major tourist attractions: the Tramway du Mont Blanc, an electric cog railway taking you up to up to the Glacier de Bionnassay (2372 metres) in style; the Bettex/Mont d'Arbois cablecar, which offers stunning views over Mont Blanc and a number of good walking options; and Les Thermes du Mont Blanc, a world-class spa with 39 degrees Celsius natural spring waters. St Gervais is also ideally placed for day trips to the mountain mecca of Chamonix (which offers a range of attractions including the Aiguille du Midi cablecar and Montenvers mountain railway) and Geneva (a city boasting international flair, great museums and natural beauty). Other day-trips within range of St Gervais include the Grand Montets cablecar (40 mins away), driving to Lausanne or Montreaux (both under 2 hours away), and driving through the Tunnel du Mont Blanc to Turin or Milan (2.5 and 3 hours away respectively). The Mont Blanc Mountain Railway (or Tramway du Mont Blanc) is an electric mountain railway running from Le Fayet (580 metres) to Nid D’Aigle (2372 metres). Popular with sightseers, walkers and mountaineers, the 70-minute journey stops at Saint Gervais (850 metres), Montivon (1320 metres), Col de Voza (1653 metres) and Bellevue (1801 metres). The 7.7 mile trip takes 70 minutes and has a maximum elevation of 24%. The trip offers stunning forest and then mountain views, in particular the western flanks of the Aiguille de Bionnnassay (4052 metres), the Aiguille de Gouter (4304 metres) and Mont Blanc itself (4810 metres). When you reach the top, you can walk to the nearby Refuge du Nid d’Aigle (offering hot and cold drinks, cakes and decent salads, though don’t expect service with a smile). For those feeling more adventurous, you can take a 30-minute walk towards the toe of the nearby Glacier de Bionnassay. Another alternative is to take the 2 hour 30 minute walk down to Bellevue to pick up a train going down (graded difficult because it involves a ladder crossing). Another good option is to hop off at the Col de Voza stop and walk uphill to the Hotel de Prarion (1860 metres, from which you can take a cablecar down to Les Chavants) or continue uphill to the Tete de Prarion (1969 metres) before retracing your steps. The railway is very popular in summer. We recommend booking in advance and getting there 20 minutes early to get in line (stragglers will have to stand during the busiest periods). Sit on the right-hand side of the train on the way up (and the left hand side on descent) if you can. when? The Tramway operates from 7.20 am to about 7.30 pm in the summer months. But check the Tramway's website for full details. £$€¥ A return ticket from Fayet to the Nid d'Aigle costs EUR37 for adults and EUR31.50 for children aged 5 to 14 years old. Family tickets are also available. Whilst the town centre offers great views of snow-capped peaks, you need to ascend before the majesty of Mont Blanc comes into full view. The Bettex/Mont D’Arbois Cablecar is the best way to do this. The cablecar leaves from the western side of town, meaning that you’ll have to cross the Viaduc de St Gervais. There’s plenty of free parking at the cablecar station in the summer months. The cablecar journey is divided into two: from St Gervais (850 metres) to Le Bettex (1400 metres), a 10-minute journey in medium size cars that hold 18 people; and then from Bettex to Mont d'Arbois (1833 metres), in smaller cabins with a similar journey time. Bettex is a charming little mountain village, built around a central green (with a children’s play area) and with bells that ring every 30 minutes. It is home to a number of good restaurants, such as Hotel La Fleche d'Or which adds a little flair to mountain classics such as mountain sausages (we had them with date and polenta cake). It is from here that you can walk to Saint Nicholas de Veroce. There is less infrastructure at D’Arbois. But the views are absolutely stunning. As soon as you leave the cablecar, you will see Mont Blanc (4810 metres) and its satellite peaks Aiguille de Bionnassay (4052 metres), Aiguilles de Tre-la-Tete (3920 metres) and Aiguille des Glaciers (3816 metres) in their full glory. A good option is to walk the 35 minutes to Mont Joux (1958 metres). For those looking for more of a challenge, you could continue on to Mont Joly (2525 metres), a three-hour walk from D’Arbois (the round-trip taking about 5 hours). Alternatively, you could descend via a number of mountain restaurants to Saint Nicolas de Veroce (1175 metres) and then traverse to the Bettex cablecar station to return to town. when? From 9am to 6pm. NB the cablecar closes for lunch between about 12.30 and 1.45 each day. £$€¥ EUR 16 for a roundtrip from St Gervais to Mont d'Arbois for adults; EUR11.60 for children (August 2017). The Saint Gervais Thermal Park (aka Thermes Saint Gervais) is another must-see attraction; it is made up of a world class spa (Les Bains du Mont Blanc), an impressive waterfall, and a restaurant, swimming pool and toy train. The Spa Thermal du Mont Blanc has welcomed visitors to enjoy its 39 degrees Celsius natural spring waters for over 200 years. The pH neutral water has a mineral content of 4 grams of dry residue per litre. That’s very good, according to a 1996 report of the French National Academy of Medicine. Visitors can enjoy the thermal water in indoor and outdoor pools, together with steam baths, Finnish saunas, hydro-massage jets, relaxation rooms, hot slabs and the obligatory spa refreshment of herbal tea. The usual range of massage and other spa treatments are also offered. Pre-booking is essential, as this is a popular attraction with limited capacity. Mother and baby and family sessions, offered twice a week, are particularly oversubscribed. Cross Le Bont Nant river and walk for ten minutes past the spa to find an impressive waterfall, the Cascade de Crepin. Passing through impressive gorges, you will encounter thundering waterfalls along this challenging path (complete with footbridges, stairs and metal ramps). The walk from the spa into St Gervais takes about 45 minutes and involves about 200 metres of ascent. The Thermal Park is a wonderful place to enjoy a day. Other smaller attractions include its swimming pool, restaurant and a small steam-powered toy train that under 5s will love. when? 9.30 am until 9 pm. £$€¥ A three-hour time slot costs from between EUR29 and EUR37. Entry to the spa together with a 50 minute treatment costs EUR137. If you are looking to immerse yourself into the Savoie gastronomie then look no further than the four speciality delis that cater for your mountain food needs. From cheese pungent enough to strip wallpaper, through to lovely jams made from local fruit and charcuterie to ensure that the holiday pounds come piling on within days of arrival, you are in for a feast. Our favourite shop is the Maison des Alpes. Conveniently located next to a superb boulanger (Boulanger Patissier Jerome Leseve), they have mouth-watering quiche, lasagne and cannelloni on offer (as well as smelly cheese and incredible saucisson and jambon), which they will kindly pack up for you. The town centre is also home to two reasonably sized supermarkets: Carrefour and Le Petit Casino. In terms of restaurants, Le Serac is undoubtedly the town’s top eatery: this joint holds a coveted Michelin star. The latest guide described its cooking as follows: “Using top quality ingredients, dishes with distinct flavours are carefully prepared to a consistently high standard.” The set lunch menu is priced at a reasonable EUR35, though expect to pay considerably more for a la carte dining. Other recommended restaurants are L’Edelweiss (next to Le Serac, offering tasty local fare and lots of cheese dishes), Restaurant Pizzeria L’Eterle and Restaurant le Galeta (for Italian cuisine) and Ronde de Carotte (also recommended by the Michelin guide). For those looking to pass the time, the town’s central square has a collection of great cafes. There is a superb children's playground at the bottom of town, with a small red train (modeled on the trains used by the Tramway du Mont Blanc), swings and a baby trampoline! At the far end of town is found a sports centre offering indoor and outdoor swimming (and two good children's pools), tennis and crazy-golf. The town also has a small climbing wall, situated underneath the Viaduc de St Gervais. Should you have any ailments whilst en vacances, Pharmacie du Mont Joly has very helpful and patient staff who can help you with all those unexpected medical emergencies that your GCSE French failed to prepare you for (such as asking for something to help you remove a splinter from your hoof). For anything more serious, the Maison Medicale du Mont Blanc (behind the main square) has two GPs, a dentist and several physios. The mountain magnet of Chamonix is a mere 20 minutes by car from St Gervais. Its principal attractions are the Aiguille du Midi (a cablecar whisking you up to over 3,800 metres for an up-close inspection of Mont Blanc) and the Montenvers Mountain Railway (a charming cog railway taking visitors to the base of the Montenvers glacier, the third largest in the Alps). Other attractions include numerous cablecar and gondola trips, Chamonix's bustling town centre, and Chamonix's various annual events and festivals. The small mountain village of Argentiere is 40 minutes by car from St Gervais. This is best known for its proximity to the Aiguille Verte (4122 metres), one of the prettiest mountains in the Mont Blanc region. Visitors can get close to the mountain by taking the Grands Montets cablecar, first to an intermediate station at Lognan (1972 metres) and then to the Grands Montets itself at 3300 metres. The top station offers stunning views and a snow garden, whilst there is a good walk to the foot of the Glacier d'Argentiere from the Lognan cablecar station. Stop off at the Refuge du Lognan (2032 metres) if you can: the food is as sensational as the views. The stunning city of Geneva, the third largest in Switzerland, is a 60 minute drive from St Gervais. Built around the eponymous lake, Geneva offers natural beauty, international flair (more than 200 NGOs are based here), fantastic museums (in particular the Museum of Art and History and the Natural History Museum), great parks and fantastic eating. St Gervais is within striking distance of a range of other cities. Lausanne and Montreaux are within 2 hours driving time, whilst you can use the Tunnel du Mont Blanc at Chamonix to cross into Italy (it isn't cheap: return use of the tunnel costs EUR54). Turin is about 2.5 hours away, whilst Milan can be reached in about 3 hours. Remember your passport if you are traveling across international borders.